Mrs. Bremer's Class: Spaghetti & Meatball Spelling & More Literacy Work Stations...and Freebies! 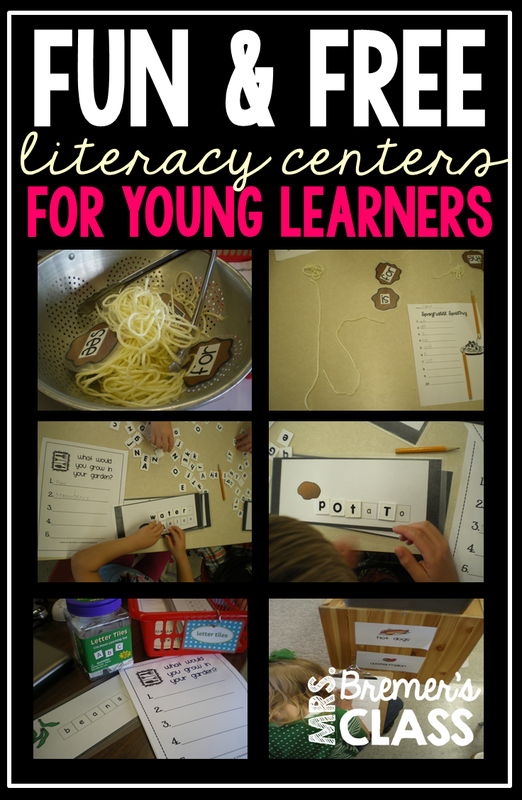 Spaghetti & Meatball Spelling & More Literacy Work Stations...and Freebies! as May's theme is God's Gift of Food. The students listened to Today Is Monday by Eric Carle. The book is great, and the song will get stuck in your head...good thing it's a fun one! Students listened to the story, then filled in this listening center story response page from Mrs. Jump. The idea of spaghetti spelling came from Tunstall Times. Since I don't have a spelling list in Kindergarten, I tweaked the idea a little bit...and added some meatballs! Students took turns picking a meatball from the pan using tongs. The meatballs have some of our sight words printed on them. They ALL took some spaghetti (yellow yarn) to form the word. Notice the word is in the picture above? Then they printed the meatball's word onto this spaghetti spelling page. You can get this Spaghetti Spelling page from Tunstall Times . Students took a grocery list page and clipboard and proceeded to hunt around the room for food words. I had them posted all over the classroom. They copied down a list of foods that they would buy at the grocery store. I had students choose five cards of foods that they would like to grow in their garden. Using letter tiles, students made the food words on their cards. These word tile cards are from Making Learning Fun. Then they copied the words onto a Garden Worksheet. This word book introduces the word and. We added the word and to our High Five chart. Foods I Like can be found at Hubbard's Cupboard. UPDATE: I have created bundles of month-long literacy centers, to make things easy for Kindergarten teachers! The packs are laid out, week by week, for the entire month. They include 5 stations for students to rotate through per week, with all of the components you’ll need for each activity. Assessment tools are included to help keep learning on track and to keep your students accountable. Learning is spiraled throughout the month, to help students build on their prior learning. Wow, I absolutely love all your ideas/.…thanks for sharing..I sometimes have a hard time coming up with ideas for the kitchen center but my kids would def enjoy the spaghetti and meatballs activity. Thanks for the shout out Anita! I am so glad you enjoyed the activity and your meatballs are TOO CUTE! I really love your ideas!!! These are really cute and I am sure that your students had a blast! Thanks for sharing. where did you find the picture for you meatballs? I love this idea and would love to use it in my classroom! I am not able to find such a good picture though. I just hand-drew a page full on brown construction paper & photocopied as many as I needed. Then I glued the words on top and laminated them. If you look here you can find some that are already printed for free: http://www.teacherspayteachers.com/Product/Spaghetti-Spelling-245280 Your class will love it! Math Work Stations: Get them for free!